A HUMAN RIGHTS lawyer has said Ireland’s abortion laws are so restrictive that many women consider suicide. Christina Zampas was speaking at the launch of Amnesty International’s report on abortion laws in Ireland, ‘She is not a criminal‘. The report notes that some 177,000 women and girls have travelled from Ireland to England and Wales for abortions since 1971. About 4,000 currently make that journey each year. “One woman told us how she was calculating how to throw herself in front of a truck or which bridge jump off. Dr Rhona Mahony, the master of Holles Street Maternity Hospital, said that essentially nothing had changed for doctors since the tragic death of Savita Halappanavar, noting the response “hasn’t effectively changed practice nor did it set out to do so”. She said it is wrong to ask doctors to delay clinical decision making until a woman is so ill she is at risk of death, describing the practice as “medical roulette”. Mahony described the case of the clinically dead pregnant woman being kept on life support in an Irish hospital last Christmas as a “macabre experiment”. The dignity of the mother was trumped by the right to life of the foetus. That such a case could happen, I find… I’m uncomfortable with that. She noted that a large part of her job is diagnosing fatal foetal abnormalities. She said she respects that some women want to continue their pregnancy in this instance, but for others this prospect is too painful. Mahony added that women “will continue to travel to the UK or obtain unknown pills from the internet out of desperation” if the laws aren’t changed here. She said doctors should be able to make the necessary referrals “without fear of custodial sentence, without fear of the law”. Amnesty wants abortion decriminalised here and for the 8th amendment of the constitution, which gives equal importance to the right of foetus to that of the mother, to be repealed. Salil Shetty, Amnesty International’s secretary general, said Ireland is the only developed country in the world where the organisation is running a campaign to change abortion laws. Shetty said the findings in the report are “quite shocking”, adding that he “would be surprised” if there was no international pressure put on the Irish government in this regard. “Even if you restrict abortion, women will still need abortions and will seek abortions,” he said, adding that women face “trauma” and “stigmatisation” by having to travel abroad for terminations. Gaye Edwards, spoke of the “sense of bewilderment and abandonment” she felt when she was told her baby had a fatal foetal abnormality. She travelled with her husband to northern Ireland for a termination, where she said they experienced ”sympathy and compassion that had been absent in Dublin”. 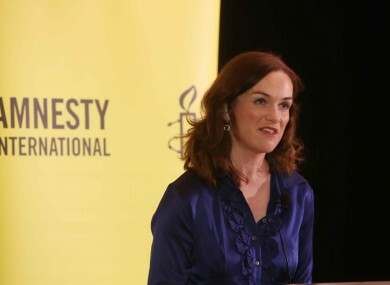 Colm O’Gorman, executive director of Amnesty International, said the organisation’s goal is to “vindicate the rights of women and girls in Ireland”, noting the country “has a poor track record for women’s human rights, particularly on sexual reproductive rights”. O’Gorman noted how “crisis pregnancies” never used to happen in Ireland because “we vanished women and girls behind high walls”. He said Amnesty is engaging with political parties about the issue, which he said should be treated as a human rights issue, not a political one. O’Gorman said it’s time to have a “more respectful and engaging conversation” o the topic for “women who we know or who we will know” that may need abortions. Representatives from Amnesty International will meet the Oireachtas health committee today to discuss the report. Email “177,000 women have left Ireland for abortions since 1971”. Feedback on “177,000 women have left Ireland for abortions since 1971”.